I made this card for Kathy's Lily Pad Palette challenge where you had to make a card using at least 3 of the colours above. This is what I came up with. Oh such a beautiful card. Wow, your card is beatiful♥. Love it. 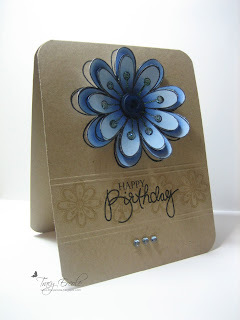 Very pretty card...I love the fabulous flower with all the dimension! Great stamped border for the sentiment too...really wonderful design! Thanks for joining in the color challenge at Lily Pad Cards. Love this delicious flower, Tracy, and also your design - beautiful use of Kathy's colors! Thanks so much for joining us at Lily Pad Cards! Simply beautiful! Thanks for joining us at Lily Pad Cards. i love this card.It's gorgeous.